There are 18 cottages in the park. 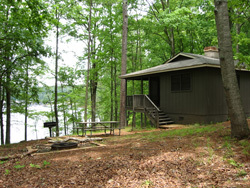 These accommodations offer you an opportunity to stay close to the shoreline of Lake Allatoona and relax in a pleasant, comfortable setting. Depending on the amount of forest and the foliage you may or may not have an unobstructed view of the lake. The cottages are all located near one another on the park's Cottage Road, forming what resembles a small neighborhood. The cottages are a great option for you if you want to spend a few nights at the park but do not want to camp. Just to be sure that you are acquainted with all of your overnight options, you should be aware you can also stay in the Lodge if you do not want to stay in the campground or the cottages. The price for cottages varies according to a number of factors . You can find the most up to date rates on the State of Georgia State Park website. You cannot reserve a cabin for a single night stay. The minimum length of time you can reserve and stay in a cabin varies from 2 to 4 nights, with longer stays required during the busier times of the year. Cabin fees do not include the Red Top Mountain Park entry fees. You are still required to pay these fees for all vehicles. Each cottage has central air and heat, a TV, and a fireplace. There are four double beds and all the linens are included. The kitchen comes equipped with a stove, microwave, refrigerator, and cookware. Outside there is a back or side deck, a picnic table, a grille, and a fire ring. 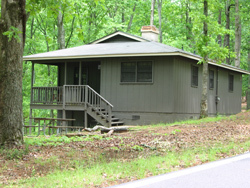 Two cabins are ADA accessible. You can call the park for more information or to make reservations 770-975-0055. Reservations can also be made online. There is at least one cottage that is designated dog friendly. If you would like to bring your dog you do need to ask if a dog friendly cottage is available when you make your reservation. Information about the requirements for dogs staying with you in a cottage can be found here.